Jimmy B scored 30 points on 12-19 shooting. Billy Johnson had a double-double before fouling out. MIT outrebounded Emerson 42-12. However, MIT couldnt overcome the refs. Their starting center, Dou Soumare fouled out in 9 minutes as MIT was called for 13 more fouls and Emerson shot 38 FTs to MITs 16. The game was played at Emerson. Emerson had 6 players score in double figures, but only one of those players score more than 10 points on FGs. Tough game for MIT to go into the break on, they dont play again until after new years. I think that's a misrepresentation of the game that was played tonight. I thought Emerson outplayed MIT and won the game. The Lions led by 11 in the 1st half and by as many as 16 in the 2nd. The Lions played their usual brand of tough D that MIT couldn't answer tonight. Soumare fouled out pretty fast, but the calls I saw were legit, especially the 5th foul when he collided with Joe Boylan. MIT started to foul intentionally with 2:02 left in the 2nd half to try to cut the deficit - 10 of those attempts were accrued at the end. Jimmy B, Gampel, and Mroz were very good as usual but Emerson won with contributions across the board - six in double figures led by Ben Chase with 23. Where did the 42-12 figure come from on the glass? I am having trouble understanding how a team is +30 in rebounds (nearly quadrupling the other teams total) and shoots 53% from the floor and doesnt win (other than the fact that Emerson was +21 points at the line). If I was the home team I would think the refs are great also. I was looking over the boxscore and game summary and I guess MIT did have alot of turnovers; however, only 6 of the free throws were in the last 2.5 minutes (not 10) when MIT was intentionally fouling. So that is still +10 in fouls and -26 in FTs. Tough to overcome. Maybe some of those turnovers were uncalled fouls? Maybe not, Im just throwing out a possible theory. Jimmy B also set the MIT school record for 30 point games in a career tonight with his 9th. Also, in the new NEWMAC stats that came out today, he is ranked first in both scoring and assists and top 10 in every other category. Dou Soumare is #1 in the conference in blocks and rebounding (you dont do that playing 9 minutes a game). I saw Dou Soumare play two years ago, and though I commend him for being a tremendous athlete, he does not play basketball like a basketball player. In the game I remember, at MIT, he slide tackled two Clark players and did eventually foul out. I recognize this was his freshman year, but it does not surprise me that he is continuing to foul out in a short period of time. MIT's coach is always a class act, and was the first to take Soumare out and yell at him for his tactics that game. I find it displeasing to see so many people trying to justify the MIT loss. Now given the rebound discrepency was huge and so were the fouls. But a win is a win and a loss is a loss. Also MIT did recieve 30 pts from Jimmy B. Give some credit to an undersized emerson squad. I have seen them a couple times each year--have yet to this year but they always seem to force teams with bigger guys to play down to them. Some credit is due to EC. I love the idea of both teams having success...Emerson (known for its outstanding communication and theater program) and MIT (known for being outstanding in general, but specifically math and engineering) are both the non-traditional schools to be doing so well in athletics. Yet, it says so much about division III athletics. And this is coming from a Clark alum (known for its liberalness). MIT fans have to remember that as disappointing as it was, it was early season, non-conference game. 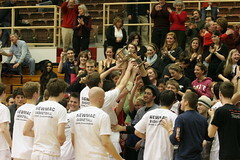 It should not burst their bubble should they not win the NEWMAC if they are in fact in contention for an at-large bid. With four out of conference losses already, MIT would almost certainly need to win the NEWMAC to get a bid -- New England out of conference bids figure to be ridiculously competitive this year. Brandeis (if they don't win the UAA), 3-4 NESCAC teams, and 2-3 LEC teams are all likely to post very gaudy records (indeed, most of NESCAC at this point only has 0-2 losses) in tough conferences, not to mention teams like Emerson. Wheaton and Coast Guard that are putting up tons of early season wins and all have only 0-1 losses so far. I would bet that other than Brandeis or a NESCAC school, no one from New England with more than four losses will have any kind of shot at an at large this year. Even four may be pushing it in a year like this. He was averaging 29 mpg before that game. Agreed, he is a great coach. He had a winning record last year with effectively 7 players total (they couldnt practive 5 v 5). They have a good shot. WPI doesnt seem too dominant and I think MIT matches up well with CGA, who is probably the best team in the league this year. I guess we will have to wait until January to see how some of the conference games unfold. Springfield's win last night over RIC showed what they're capable of when they just shoot an average FG %. They were ahead all night until RIC started burying 3's to catch up. Nice to see them stay composed after fouling a 3 pt shot to let RIC tie with 24 secs and then nail 2 FT's with 13 secs to go. A good sign to win a close game against a top 25 team. Strong defense has been there all year. Now if they just work on shot selection to improve shooting % it'll be fun to see them surprise the NEWMAC. MIT will have some size over the next 4 years as it has "signed" 6-10 Northfield Mt Hermon center Ted Eby. For details, go to http://www.newenglandrecruitingreport.com/news/article/260/Ted-Eby-Headed-to-M.I.T..php. He sounds a bit raw, but anyone who is 6-10 always has some upside. The article also mentions that MIT has received a commitment from 6-3 Phillips Exeter guard Jamie Karraker. Anyone know how Conn lost control of the MIT game? I'd say CTc did not "blow" a lead, but MIT turned up their defensive effort and started to run their offense through Bartolotta and Dou, which was not happening in the first half. CTc is not a deep team, nor a tall team. MIT exploited their height advantage in the 2nd half. And Bartolotta is one of the best offensive talents in New England D3. CTc does not have the guard quickness that Emerson College has, so their pressure defense disrupted MIT for a while, but MIT did not really have trouble with it after halftime. The season statistics imply that CTc is a good defensive team, but in reality they are a deliberate low scoring team. Once MIT found its offense, CTc had a hard time keeping up their own scoring to match. Down the stretch, CTc's offense was often 1-and-1 foul shots from MIT's overly aggressive defense. Without those MIT fouls, MIT may have won in regulation. Also, MIT has been pretty good on their home court, other than this first half against CTc coming off the holiday break. To add to what T990 said. MIT started to play their game in the second half. Bartolotta really asserted himself as he scored 24 of MIT's final 30 points, leading the team to the comeback. In the OT, they began to help up off the post on Bartolotta when he drove, so he was able to dump the ball to Billy Johnson and Dou Soumare for easy buckets (he assisted the first 3 FGs of the overtime). For the game, Bartolotta scored 29 points (26 in the second half) on 8-14 shooting with 5 assists and 5 steals and Dou Soumare scored 25 points on 9-15 shooting with 11 rebounds. MIT plays Lesley today at 1. Don't look now but Wheaton has quietly put together a pre-league 9-1 record on the heels of today's 87-67 win over a pretty good (6-3) Fitchburg State team. What makes it all the more impressive is that Wheaton is starting 3 freshmen along with a sophomore and junior, and the first guard off the bench is another freshman. And those freshmen are leading the team in scoring, paced by shooting guard Anthony Coppola, a Boston Globe super team member least year. Wheaton has also beaten Connecticut College (by one) and Bridgewater State. It's only loss is to Emerson by 20. Wheaton opens up league play this Wednesday at MIT, and then hosts Tufts on Saturday, so we'll get a better read on this team this week, but so far the freshman--all of whom are guards--have not only been fearless, but also pretty impressive. MIT won today in their final non-conference game. MIT scored 19 unanswered points in the first 3:38 to open the game open and never really looked back. Jimmy B had a double double with 22 and 10, along with 5 assists. Dou Soumare had 7 points and 15 rebounds, while Will Mroz had an exceptional first half with 16 points, all in the first frame. MIT plays a much improved Wheaton team at home on Wednesday in both teams conference openers.